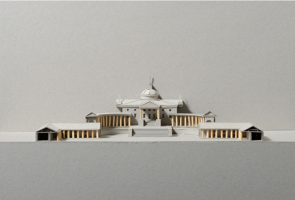 The successful three traveling exhibitions of 2016 entitled PALLADIO AND THE MODERN, that highlights the universal principles of architecture, were hosted by The Cape Institute for Architecture in April in Cape Town, by the Department of Architecture of the University of the Free State during the Free State Festival in July in Bloemfontein, and by the School of Architecture and Planning of the University of the Witwatersrand (Wits) in August/September in Johannesburg during the AZA16 Architecture Students Congress presented by the South African Institute of Architects (SAIA). The traveling exhibition returns to its home city with a final exhibition being hosted by the Nelson Mandela Metropolitan Art Museum in Port Elizabeth from the 17th of August to the 15th of September 2017. Besides being a recognition of student work, the aim of the traveling exhibition is to, not only, introduce the work to students of other Architecture Schools and the Architecture Profession itself but also to share the Discipline of Architecture with a wider public to increase public awareness of the role of Architecture in contemporary society in its social and cultural context. In this attempt in promoting public understanding, widening thoughts and debate about architecture, its history of ideas and buildings, theory and practice and its role in contemporary society, the exhibition is an educational and cultural event. There is a call to the conscience of modern and contemporary architecture to protect its past and advocate for its future as a vital art form and a public concern. It is the first exhibition of its kind of scale, over 400 exhibition pieces, in South Africa of first year architecture student’s work.